After a period of decline, pedestrian deaths from accidents involving SUVs have shot up by 81 percent in the last decade. The data was recently released in a report released by the Insurance Institute for Highway Safety and reported by NBC News. One major question related to the data, however, is why the sudden increase has occurred. While the IIHS has suggested a few key factors, the National Highway Traffic Safety Administration has offered an alternative read on the causes of these accidents, leaving auto makers and local laws to sort out application of the data on their own. The IIHS report listed a number of factors that could be contributing to the increase in pedestrian deaths involving SUVs. While acknowledging the role of increased highway speed limits and distracted drivers, the IIHS largely focused on one explanation: there are simply more SUVs on the road. They contend that the design of SUVs, which have higher front ends and more vertical designs in general than other passenger vehicles, make it more difficult for a pedestrian hit by an SUV to avoid serious injury by rolling away. The case for this claim is bolstered by the fact that SUV sales have seen a significant increase, to the point where SUVs currently represent more than half of all new vehicles sold. The IIHS seems to be accepting that having more of these vehicles on the road would account for much of the recorded uptick in fatalities. Not everyone is convinced that the sales numbers actually account for all of the damage caused. The NHTSA points to smartphones, linking roughly one in every 10 fatal accidents to distracted driving. This agency also notes that drivers are not the only ones occupied with technology, and holds pedestrians accountable for incidents in which their own distraction contributes to an accident. Between higher incidence of distracted drivers and a similar rise in distracted pedestrians, the NHTSA seems to be placing the blame on our infatuation with technology. Auto makers are taking a shot at the problem with technology of their own. Originally the purview of luxury vehicles, crash warning and pedestrian detection systems are moving to a broader range of passenger vehicles. Meanwhile, Honolulu has begun to crack down on distracted pedestrians who contribute to accidents. Additionally, safety experts are considering the impact of marijuana legalization on pedestrian accidents. Ultimately, the specific causes of a given accident will vary on a case-by-case basis. There is validity to concerns about vehicle design, drug use, distraction while driving and walking, and infrastructure issues. 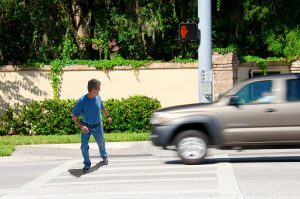 If you have been the victim of a pedestrian accident, it is vitally important that you have someone willing to examine the details of your specific situation and fight for your rights. Tell them you mean business by contacting us today to learning about your options.